Yesterday I spent sometime with a good friend of mine. He is one of the best and most passionate dancers I have met under the sun! Watching him on stage yesterday got me thinking about how the mind affects our actions. In the last month or so, i have discovered that I have to work on my thoughts. I have so many things I want to do in this life but them coming to pass is greatly dependent on what I think. Many times when I get doubts about my ability to perform a task that is before me, when I allow these doubts to grow, they slowly cripple me and become a reality. I end up not doing the task at all or doing it poorly! However, when I talk to myself and remind myself of all the gifts and abilities that Yahweh has placed in me, I am able to do exploits, unimaginable, unfathomable things for His Glory. Last week I was practicing my driving lessons. I saw how i was doing very well most days until one day I started to think, “Ndanu you are learning too slow, will you ever be able to drive alone in these streets of Nairobi?” . That day I had no confidence on the road and I made 1000 mistakes because I allowed doubt to take root in my head. 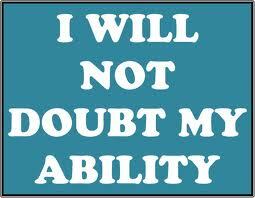 Doubt crippled me. I gave up on learning the guitar a while back because of the same doubts and self discouragement. I however resumed the lessons and I am taking a day at a time!! It is hard hard work because there is so much to learn but I will be a much better musician when I am able to play the guitar and so many people are learning to play everyday! I have the mind of Christ and soon I will be playing very well!! I will keep practicing and believing that I can do it!! In August I will be doing my very 1st wedding cakes. It is such a big deal for me and I have pressure from within to do an exceptional job. I have been thinking of the designs and I want to sketch and choose the final design. I am keeping my mind free of doubt about my ability to do this job. You see, doubts are lies. Lies that you are not good enough, lies that you do not have the gifts that God gave you, lies that you cannot change the world with your gifts. God has blessed my hands and given me tonnes of creativity! He has brought this cake job to me as a start to many more! I will bake, decorate and do an amazing job!! My gift will set me up to dine with Kings! My gift will bless many and as I glorify God with my gifts, He will draw men to Himself! Awesome truth there. Just awesome. Wow! or should I be saying ouch! Let’s just say, you’ve hit a nerve…squarely. I’ve also had those moments that I keep thinking am not good enough at something or ‘what if something goes wrong’ and all that stuff. But am slowly learning to take the risk, to believe in the gifts the Lord has bestowed upon me and nudge myself “go! go! go Ally!” We have to learn to be our best cheerleaders becoz at times, there’s noone available to cheer us up! …and speaking of guitar…I better go dust mine 😉 Thanks hon!